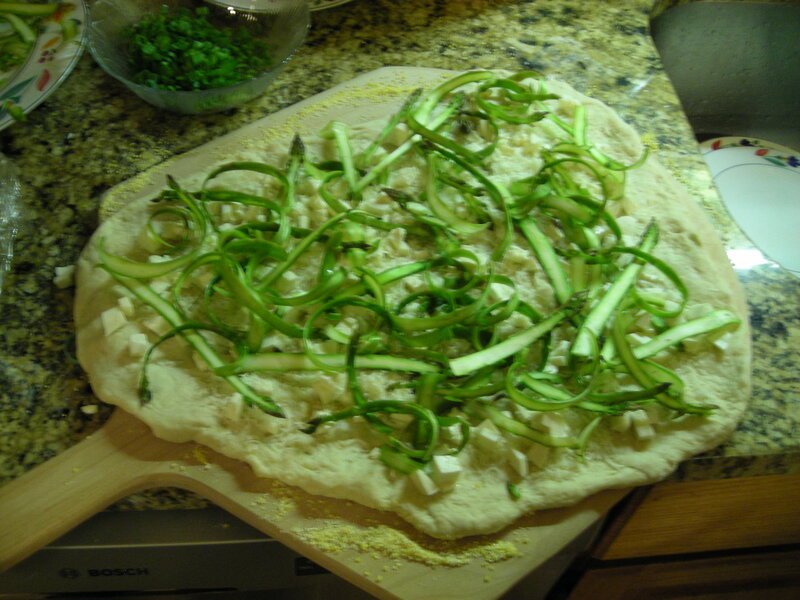 After having successfully shaved a pound of asparagus for the pizza, shaving asparagus for pasta seemed like a good idea. But either my vegetable peeler got tired and dull, or the storebought asparagus wasn’t going to put up with being shaved and was having none of that. So I sliced it into slivers, using a very sharp knife. Sounds like a lot of work? Yes, but worth it. This dish is all about the asparagus, so I cut down on the amount of pasta. If you like more pasta and less vegetable, then use a full pound of pasta. I used whole wheat pasta, which made for a nutty taste that played nicely with the walnuts, but regular pasta would work well, too. 1. Snap ends off asparagus. 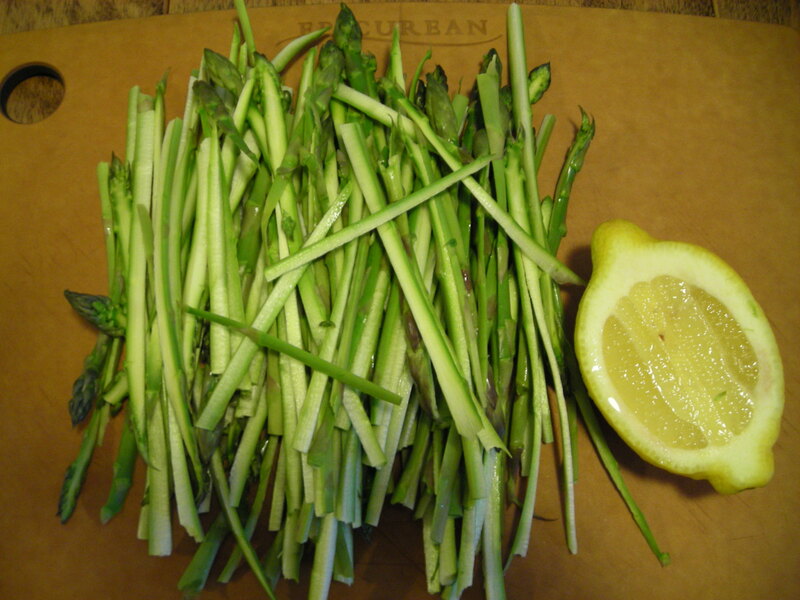 Slice each stalk horizontally into 4-5 thin slices. 2. Heat salted water for pasta. 3. In small skillet, toast walnuts over medium low heat, tossing and watching carefully. When nicely toasted, transfer walnuts to a bowl. 4. Saute olive oil in large pan over medium heat. Add shallots and garlic and cook, stirring frequently and being careful to not burn the garlic, about 2-5 minutes. Add lemon peel, lemon juice, and 2 tsp of oregano, stir, then add asparagus and salt to taste (I used about 1 1/2 tsp salt). The cooking time for the asparagus will vary depending on how tender or firm you like the asparagus. I cooked mine for 12 minutes over medium high heat, for a more tender asparagus. 5. Cook pasta according to package directions, and drain it in collander. 6. Put pasta in large bowl, pour asparagus over it, toss, then toss in walnuts, remaining oregano, chopped parsley, and salt and fresh ground pepper, and top with grated cheese, if using, and enjoy. 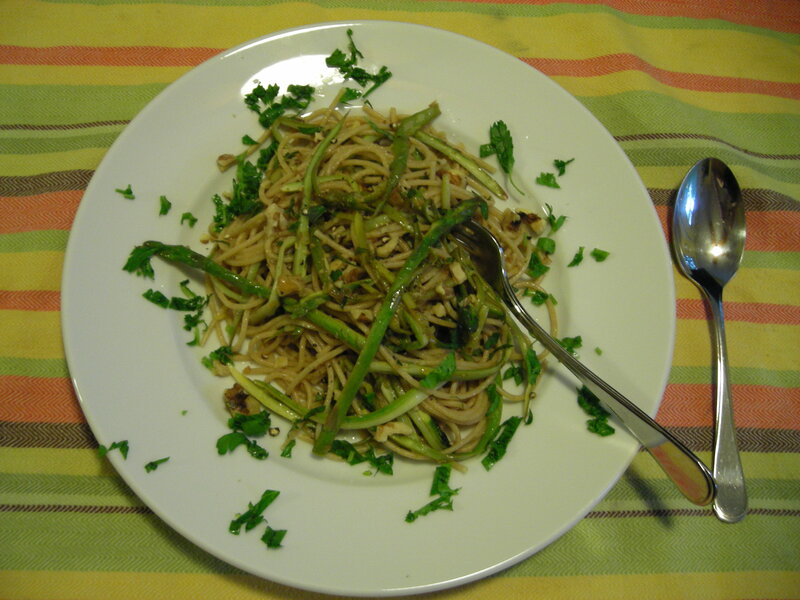 This entry was posted in Healthy, Pasta, vegan and tagged asparagus, Pasta, vegan by Amy. Bookmark the permalink.